The Waterless™ DX Geothermal system moves heat energy from the earth through a closed loop of environmentally-friendly refrigerant. The system uses buried copper tubing to collect heat from the ground and transfer it into your home. Refrigerant circulates through the ground loops and the indoor heat exchanger while the air handler pushes heated or cooled air through the home. At the center of it all, the heat pump, which is installed inside the home or garage, works to move refrigerant through the ground loops and throughout the heating and cooling distribution system. Within the Waterless™ Geothermal system is a uniquely-innovative, patented technique that enables control of the flow and stability of the refrigerant without any electronic devices, thereby further improving efficiency and reliability. The refrigerant is efficiently managed by two simple proprietary flow control devices. These two mechanical controls respond directly to the temperature and velocity of refrigerant flow through the system. They modulate the amount of refrigerant in circulation to assure optimum efficiency at all times. By eliminating subcooling in the condenser, the system operates at lower refrigerant “head” pressures with increased mass flow. Which maintains higher heat efficiency, is better at removing humidity, has higher heat output, better system reliability, and a longer lifespan. To capture the heat stored deep underground, copper ground loops can be buried anywhere between 5 ft. to 100 ft. below the ground surface. These copper loops, and the refrigerant that circulates through them, collect and transfer heat up into the heat pump. A key differentiator between the Waterless™ DX Geothermal systems and other geothermal systems is the copper ground loops. Copper is highly conductive and carries heat extremely well. It also has a long life span, and can last entire generations. This means that while the heat pump may eventually need replaced, the copper ground loops could last longer than our lifetimes. It’s a stable metal and non-corrosive in most soil conditions. In the case of less-than-ideal soil conditions, a ground loop protection system protects the pipes from corrosion. 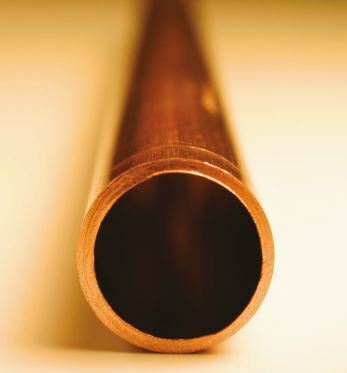 The diameter size of the copper piping (1/2″ & 1/4″ diameter) used in a DX geothermal ground loop is much smaller than the diameter of a plastic pipe (3/4″ & 1″ diameter) used in a traditional water source geothermal. The installation of a vertical DX geothermal ground loop, requires a much smaller diameter hole to be drilled due to the smaller diameter copper tubing. Drilling cost for a much smaller diameter hole can save you a substantial amount of money when it comes to the installation of DX geothermal ground loop. Within the closed-loop system of copper pipes, R-410a environmentally friendly refrigerant is continually circulated through the heat pump and the loops. It’s job is to gather heat from the ground and move it up into the geothermal heat pump. The refrigerant is a safe and efficient way to move heat from one area to another and has been used for decades in grocery stores, household refrigerators, and air conditioning units to name a few. When used in combination, copper ground loops and refrigerant are able to transfer more heat and provide hotter air than other similar systems on the market. The compressor pump is an integral part of the Waterless™ DX Geothermal system. It is the component that pumps the refrigerant through the earth loops and throughout the home’s indoor heat exchanger. With Waterless™ DX Geothermal’s patented technology, the system is able to control the flow of the refrigerant. By modulating the amount of refrigerant in circulation to assure optimum efficiency at all times. Depending on the time of year, the Waterless™ DX Geothermal will efficiently heat or cool your home or building. The system is connected to the thermostat and lets you control the temperature and humidity level. Once the heat transfer is complete, the system moves the newly-heated or cooled air throughout your house via the system’s air duct system. We’ve created an entirely new system that enhances the benefits of drawing on geothermal energy to heat and cool homes. Click here to see what makes Waterless™ DX Geothermal so different from a standard water geothermal.